This was a big day for me! The Boulder Daily Camera published a great article about my project in the Sunday paper and I got nominated for my very first award! The Bookshelf Gargoyle is just that- a small stone monstrous creature that sits on a bookshelf holding books up. However, he is crazy creative just like Jeff Wu of Team Alchemist Blog, eco bicycling gear designer, bike racer and family man by day, ER doctor by night. Right now he’s in Tanzania with Doug Pitt’s charity that helps supply fresh water. He’s a cool guy, a funny writer and doesn’t appear to need sleep at all. 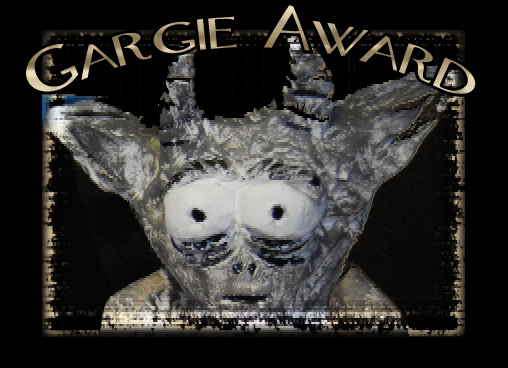 He has been so encouraging about my blogging and I’m nominating for a Gargie because he deserves it! « Today, The Daily Camera. Tomorrow, the Huffington Post! I found your blog today while farking. Totally love it! I will be following it to get motivated and inspired to try the purge 10 items a day myself. It might be hard on the days I work the 12 hour shifts at work, but maybe I can make up for it later in the week. Now if I could only get your motivation for working out and better eating habits to go along with it, that would be perfect. Too bad we don’t have pole dancing instructors around here! I’m not sure where you live but you can learn a lot from studioveena.com. It is a subscription based website that offers on-line lessons from beginning to expert. I know a really amazing pole dancer that got her start with veena. Good luck with your own purge process. Take it easy on yourself, though. Give yourself a free pass on those 12-hour days! Thanks for following.